Ascension Island (7.95°S, 14.37°W) is one of a number of hotspot oceanic islands in the South Atlantic (which include the sister islands of St. Helena and Tristan da Cunha). Ascension lies close to the Mid-Atlantic Ridge (80 km to the east) and just south of the Ascension Fracture Zone (50 km to the north). Unusually, Ascension Island is not hotspot-centred; geophysical and geochemical indications are that the Ascension hotspot lies to the east of the Mid-Atlantic Ridge at about 10°S, some 250-300 km distant from the island. The volcanic edifice tipped by Ascension Island is constructed on 5- to 6-million-year-old oceanic crust of the South American Plate which lies at a depth of 3,200 m below sea level. The basal diameter of the volcanic edifice is some 60 km, and only the topmost and youngest few percent of the volcanic structure is exposed above sea level. Nothing is known of the submerged part of the volcano. Ascension Island has an area of 98 square kilometres and a varied topography, being generally higher and more rugged in the central and eastern parts of the island. Ascension is arid and barren, although in recent years vegetation has spread somewhat from Green Mountain to lower elevations. 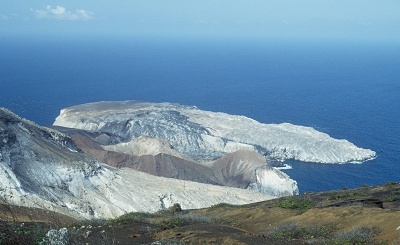 Profile of Ascension Island seen from the south. The width of the island in this view is ~13 km and the highest point, Green Mountain, has an elevation of 859 m.
Ascension is unusual among oceanic islands in having a high proportion of pyroclastic deposits relative to lava flows (approximately 40:60 based on exposure). 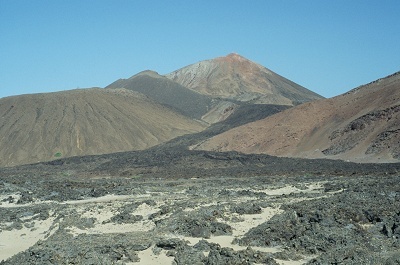 The central and eastern parts of the island predominantly comprise pyroclastic deposits (both mafic and silicic) and trachyte lava flows and domes. 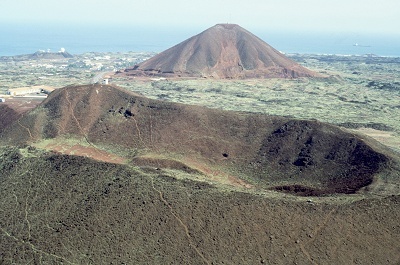 The rest of the island predominantly comprises scoria cones and mafic lava flows, some of which have a thin veneer of pyroclastic deposits (geological map). K-Ar whole rock age dates (mostly for trachyte) suggest that the oldest exposed rocks are about 1 million years old. Volcanism has continued through to recent times, the field appearance of some of the mafic flows suggesting that they were erupted in the last 1,000 years (there are no reports of eruptions since the discovery of the island in 1501, although the island was uninhabited until 1815). In excess of 50 scoria cones dot the surface of Ascension. All of the cones have an oxidized surface layer, and some are pervasively oxidized. Most of the cones are predominantly composed of cinders with minor blocks and bombs, but some are predominantly composed of blocks and bombs. Command Hill viewed from the southeast (the rim of Dark Slope Crater). In the distance is South West Bay Red Hill (elevation 223 m). The intervening ground is formed by lava flows. At the distant left is the small scoria cone of Cat Hill (top bulldozed flat with "golf ball"). 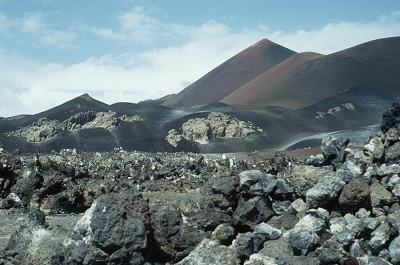 The scoria cones typically are asymmetric in shape, having over-steepened southeastern flanks and shallowly dipping northwestern flanks due to the southeast trade winds (which blow constantly across the island) concentrating the scoria down-wind. The consequent weakening of the southeastern flanks commonly has resulted in the eruption of breach flows from this side of the cones. Broken Tooth (elevation 228 m) viewed from the southeast (the summit of Hollow Tooth). The benmoreite breach flow has well developed levees which curve to the northeast (toward the sea) near the base of the cone. The breach flow is over-run by a young hawaiite flow from Sisters. The mafic (basalt to benmoreite) lava flows on Ascension have predominantly been erupted from breached scoria cones. The mafic flows typically are a few metres thick, are scoriaceous, and generally aphyric to sparsely phyric. Phenocryst phases are plagioclase, olivine, clinopyroxene, and titanomagnetite. Sequence of mafic lava flows in a cliff section on the northeast coast of Ascension. 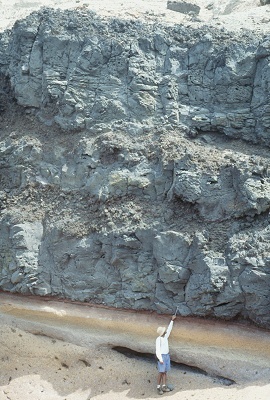 Note baked contact of pyroclastic deposits underlying the lowermost flow and the flow breccia developed at the base of the two upper flows. Nearly all of the lava flows are aa flows and flow fronts are generally steep and fairly easily recognized. The flows are of variable volume; most are small volume flow lobes of limited areal extent, but rarer flows extend for a few kilometres from their centre of eruption. The flows generally were erupted during the waning stages of activity of the scoria cones. Northeast side of Sisters Peak (elevation 446 m) with young hawaiite flow originating from a breach high on the flank of the cone. This flow extends to the coast (3 km to the north), and flows around Broken Tooth. The flank of Perfect Crater is in the left of the view and the flank of Sisters Red Hill in the right of the view. Dykes are rare (there are but a few exposed on the island), and of the lava flows that can be identified with their vents only the young benmoreite lava flow on Letterbox was fissure-fed. View of Letterbox from the old NASA site. The fissure flow was erupted on trachyte; the fissures are just visible. In the nearer distance is the Little White Hill rhyolite dome which is ringed by scoria that drapes over trachyte at the coast (forming Wig Hill). To the left the ground rises toward White Hill. Trachyte and rarer rhyolite flows and flow domes are predominantly found in the central and eastern parts of Ascension. Those on and around Green Mountain have K-Ar ages of 0.8 to 1 million years, whereas the Weather Post and Devil's Cauldron flow domes were erupted within the last 60,000 years. Obsidian is found associated with some of the trachyte flows. There are no clear temporal relationships between silicic and mafic volcanism. Daly's Crags viewed from the northwest. The trachyte forming the Crags has a K-Ar whole rock age of 740,000 years, and is mantled by mafic scoria derived from a vent to the southeast. In the background to the right is the Sisters complex, with the smaller, older cone of Sisters Red Hill to the left. In the foreground is a guano-spattered aa lava flow. Mafic and silicic pyroclastic deposits are distributed across much of Ascension Island. 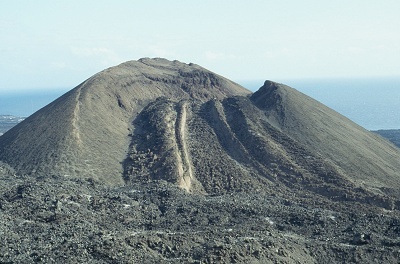 Most of Green Mountain is composed of pyroclastic deposits, both scoria and pumice, and many of the lava flows in the western part of the island have a thin pyroclastic veneer. There have clearly been some very violent explosive silicic eruptions on Ascension. Many of the pyroclastic deposits show evidence of having been reworked by water, suggesting that Ascension's climate was substantially wetter in the past. For example, Darwin recognized that the pyroclastic deposits which fill the central depression in Devil's Riding School were deposited in a lake. Ascension is noted for its varied xenolith suite. Gabbroic xenoliths are particularly abundant at Dark Slope Crater, and have isotopic (Nd and Pb) compositions different to those of the exposed volcanic rocks, implying a change in the source region during the history of volcanism. Syenite xenoliths entrained in the breach flow from Broken Tooth have been partially melted and contain veins and small pods of glass. Granite xenoliths are the intrusive equivalents of the rhyolite flows, and have the same isotopic characteristics. The volcanic rocks of Ascension (selected chemical analyses) define a mildly alkaline basalt - hawaiite - mugearite - benmoreite - trachyte - rhyolite suite (silica - total alkalis diagram). The more evolved compositions (mugearite through trachyte and rhyolite) are derived by crystal fractionation of parental basalt or hawaiite magmas. The basalt and hawaiite compositions are typical of oceanic islands in being highly enriched in the more incompatible trace elements (e.g., Zr/Nb is low, in the range 4 to 6, and REE patterns are light rare earth element enriched). In detail, four distinct basalt and hawaiite magma types are recognized based on trace element characteristics, and the different magma types were erupted in particular parts of the island, in some cases approximately contemporaneously. Radiogenic isotope (Sr, Nd, Pb) compositions are different between the magma types, implying significant small scale chemical heterogeneity in the magma source region. The trachyte and rhyolite flows and pumice are isotopically similar to the mafic flows, with the notable exception that trachyte and rhyolite with low Sr have very high initial Sr isotope ratios, the most likely source of the radiogenic Sr being through introduction of seawater. Our (Barry Weaver [bweaver@ou.edu], Aditya Kar, Jon Davidson, Mike Colucci) work on Ascension Island is supported by the National Science Foundation. Daly, R.A. 1925. The geology of Ascension Island. Proceedings of the American Academy of Arts and Sciences, volume 60, pages 1-80.
van Tassel, R. 1952. Dalyite, a new potassium zirconium silicate, from Ascension Island, Atlantic. Mineralogical Magazine, volume 29, pages 850-857. Atkins, F.B., Baker, P.E., Bell, J.D. and Smith, D.G.W. 1964. Oxford expedition to Ascension Island, 1964. Nature, volume 204, pages 722-724. Gast, P.W., Tilton, G.R. and Hedge, C. 1964. Isotopic composition of lead and strontium from Ascension and Gough islands. Science, volume 145, pages 1181-1185. Roedder, E. and Coombs, D.S. 1967. Immiscibility in granitic melts, indicated by fluid inclusions in ejected granitic blocks from Ascension Island. Journal of Petrology, volume 8, pages 417-451. Harris, C. and Bell, J.D. 1982. Natural partial melting of syenite blocks from Ascension Island. Contributions to Mineralogy and Petrology, volume 79, pages 107-113. Harris, C., Bell, J.D. and Atkins, F.B. 1982. Isotopic composition of lead and strontium in lavas and coarse-grained blocks from Ascension Island, South Atlantic. Earth and Planetary Science Letters, volume 60, pages 79-85. Harris, C. 1983. The petrology of lavas and associated plutonic inclusions of Ascension Island. Journal of Petrology, volume 24, pages 424-470. Packer, J.E. 1983 (3rd edition). The Ascension Handbook. 54 pages. Weis, D. 1983. Pb isotopes in Ascension Island rocks: Oceanic origin for the gabbroic to granitic plutonic inclusions. Earth and Planetary Science Letters, volume 62, pages 273-282. Harris, C. 1985. Guano-derived rare earth-rich phosphatic amygdales in gabbroic inclusions from Ascension Island. Earth and Planetary Science Letters, volume 72, pages 141-148. Sheppard, S.M.F. and Harris, C. 1985. Hydrogen and oxygen isotope geochemistry of Ascension Island lavas and granites: Variation with crystal fractionation and interaction with sea water. Contributions to Mineralogy and Petrology, volume 91, pages 74-81. Harris, C. and Sheppard, S.M.F. 1987. Magma and fluid evolution in the lavas and associated granite xenoliths of Ascension Island. In: Alkaline Igneous Rocks (Fitton, J.G. and Upton, B.G.J. editors), Geological Society of London Special Publication 30, pages 269-272. Weaver, B.L., Wood, D.A., Tarney, J. and Joron, J.-L. 1987. Geochemistry of ocean island basalts from the South Atlantic Ocean: Ascension, Bouvet, St. Helena, Gough and Tristan da Cunha. In: Alkaline Igneous Rocks (Fitton, J.G. and Upton, B.G.J. editors), Geological Society of London Special Publication 30, pages 253-267. Weis, D., Demaiffe, D., Cauet, S., and Javoy, M. 1987. Sr, Nd, O and H isotopic ratios in Ascension Island lavas and plutonic inclusions; cogenetic origin. Earth and Planetary Science Letters, volume 82, pages 255-268. Weaver, B.L., Kar, A., Davidson, J., and Colucci, M. 1996. Geochemical characteristics of volcanic rocks from Ascension Island, South Atlantic Ocean. Geothermics, volume 25, pages 449-470. Kar, A., Weaver, B.L., Davidson, J., and Colucci, M. 1998. Origin of differentiated volcanic and plutonic rocks from Ascension Island, South Atlantic Ocean. Journal of Petrology, volume 39, pages 1009-1024.